Simple Financial projections template for easily preparing 12 month to 7 year financial forecasts; financial projections include profit and loss forecasts; cash flow projections; with a projected balance sheet at the end of each period. When you’re running a business, the last thing you want to get bogged down with; is in preparing lengthy and complicated Excel spreadsheets. Simple to use Excel template for profit and loss forecasts; cash flow forecasts and a projected balance sheet. No in-depth knowledge of Excel required. Plus you don’t need to know how to write Excel formulas. A projected balance sheet and profit and loss account done for you…all you need to do is to enter you company information and settings…and the data. Simple, easy and fast. Professional reports with easy to use Excel-based template software and ‘quick to get started‘. A speedy projected balance sheet and profit and loss account. Within no time, you’ll have professional reports which forecast for 12 months, 24 months, 3 years, 5 years and even up to 7 years. Professional reports ready for presenting to banks for bank lending; to use for angel investment; for your management meetings; or to support your business plans and annual budgets. Save time, save money…all for a small $127 fee. Preparing complex Excel spreadsheets from scratch is at best time-consuming. Working out the formulas and which numbers go were can lead to headaches for some. Also, when you prepare any balance sheet using formulas, there’s no guarantee your figures will balance at the end. Invest in Cash Forecaster where all the hard work and difficult formulas have already been calculated for you. Save time, look professional and get the job done fast. Making the correct VAT-inclusive* or VAT-exclusive* entries are complicated. Getting them on the right reports can be tricky too. It’s important to differentiate between the ‘net of VAT* (Sales Tax) figures,‘ which are reported on the profit and loss projection reports; vs the numbers that are shown on the cash flow forecasts. However, this is all taken care of with our financial projections template for you. Cash Forecaster Software makes this quick and easy. VAT* entries are done for you. You just need to know which products, expenses or services are Vatable*…simple. * The financial projections template is also set up to account for sales tax and/or GST. Most small businesses have capital expenditure. They also have assets disposals too. Additionally, businesses depreciate their assets over time. In addition to including these numbers on the cash flow projections, the need to be incorporated on to the projected balance sheet too. Capital expenditure could include buildings, motor vehicles, plant, equipment, computers, furniture and other assets. Using our financial projections template you enter your opening fixed assets. Then add any new planned-for capital expenditure and any planned disposals in the forecast period. It’s extremely easy to enter the asset type; the fixed asset cost; the fixed asset purchase date; the VAT (Sales Tax) rate; the sale date of assets disposed of; and the software does the rest for you, including automatic depreciation calculations. All the numbers are put in the right places on right reports, in the correct month ending with a projected balance sheet at the end of your forecast period(s), be it 3 year forecasts, 5 year forecasts or a shorter 12 month forecast. Our forecasting template incorporates business bank loans or hire purchase contracts for fixed asset purchases. Your financial projections can also be used to calculate any bank overdraft facility requirements for your small business. This easy to use loan function includes many different loans types that are available to small businesses. The template has built-in loan and hire purchase functionality to suit most types of business loan facility. The outstanding amount on any loan or hire purchase is included on the projected balance sheet at the end of each month of the forecast reports, and on the summary yearly balance sheet report. Another time-saving feature is the sensitivity analysis tool. It’s important to stress test your cash flow and profit and loss forecasts. With Cash Forecaster, this is made to be easy. 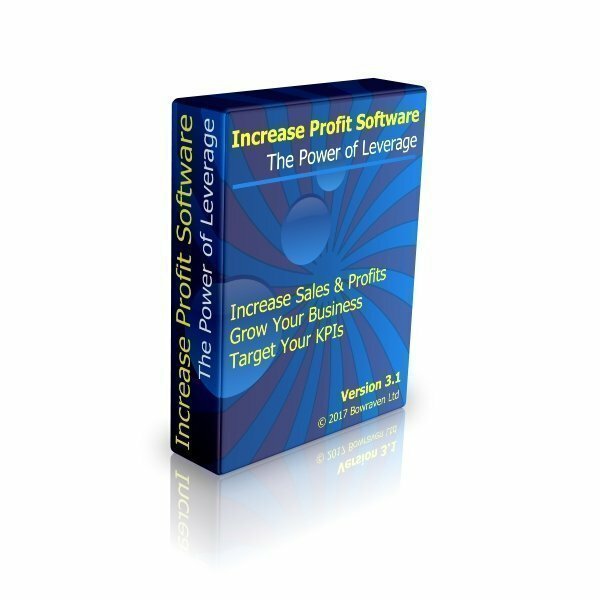 With the click of a button, you can quickly increase or decrease your sales and/or cost of sales. This feature saves you time by not having to re-enter your data over and again. Banks and investors often want to know your best case or worst case business scenarios, before they will lend or invest. Our simple financial projections template makes the task of your what-if scenarios quick and easy. Everyone benefits when our Cash Forecaster software is upgraded. Most of the new features we include are suggestions from customer that have already purchased. Recently a client was recommended to use our software by Lloyds Bank Plc. This customer asked for a specific report, so we upgraded Cash Forecaster free of charge, as it would benefit future customers too. The projected balance sheet format uses the standard balance sheet. An example of which is shown in Figure 1. 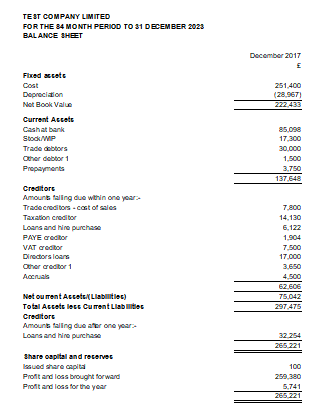 The format used for the projected balance sheet is with the assets and liabilities in the top section; with share capital and reserves in the bottom section. For this feature rich financial projection template, all you pay is a small $127 fee. Projected balance sheet for 12 months; Projected balance sheet for 24 months; Projected balance sheet for 3 years; Projected balance sheet for 4 years; Projected balance sheet for 5 years; Projected balance sheet for 6 years; and a Projected balance sheet for 7 years. The ones in bold are the most popular periods to project. The forecasting template is Excel-based software. You will need to have Microsoft Excel installed on your computer, in order run the software. But, you don’t need to have expert knowledge of Excel or Spreadsheets in order to use the program, as it is easy to use and fully explained in the user manual that accompanies the software.